Posted on Friday, July 20th, 2012 at 2:03 am by Ty Anderson. The floodgates have opened… The Office 2013 Consumer Preview is upon us and with it. Anyone and everyone that rides rides in the wake of Microsoft is writing about it. Journalists, hobbyists, MVPs, developers, stock analysts… and well, Microsoft have done the equivalent of a White House Friday data dump. Except here, the information is almost all good stuff and I’ve had most of the week to sift through. I started with Tuesday’s Office 2013 Special Edition Newswire and I’ve started breaking it down. The fact is, there’s just too much to cover. So… we’ll take it a bit at a time and cover some major areas like users, developers, & IT pros for Office and SharePoint alike. We might even cover small businesses. Once done, I’ll start digging in to the biggest new features. Of course, I’ll have a bias toward developer content. But I’m a user too so I’ll have plenty of good content and opinions for user’s too. I present to you some of the better articles I found that attempt to cover the entire Office 2013 application suite. I’ll comment when I feel like it. Welcome to the Office 2013 public preview :: Let’s begin with the Mr. WinSuperSite, Paul Thurrot. Office 2013: a pleasant surprise :: Simon Bisson of ZDnet believes Microsoft made good decisions balancing Windows 8 Metro and the traditional Windows desktop. Microsoft Office 2013 preview: details, screenshots and impressions :: Engadget covers all the major apps and finds Office 2013 to be nimble and dazzling. Office 15: Microsoft’s best bet for beating dropbox, iCloud, Google Drive :: FastCompany… first time they’ve made the Newswire if I am correct. They have a laser-like focus on MSFT’s Office + Cloud strategy. This is no secret… Microsoft wants you to pay a monthly subscription. Microsoft Office Division Chief on new software: [Video] :: Bloomberg. A quick interview of Kurt Delbene. I wonder, with all the talking he does on a daily basis, if he is exhausted at the end of the day. I would be. I laughed when the interviewer didn’t know what the ribbon is. What’s the deal with Office Customer Preview? Office Customer Preview FAQ :: Lots of answers to questions I didn’t think to ask. That’s because I’m most interested in the developer stuff. But these are good things to know too. What are the significant new features of Office 2013? It’s fun to see what people think are the best new features. Here are a few opinions. What’s new in Office 2013 :: This is specific to Office Pro Plus and is straight from Microsoft. I suppose you could say it is propaganda. I choose to call it their opinion. Whatever you call it, this tells you how Microsoft is going to market and will help you in your efforts to sell solutions around it. The new Microsoft Office: 20 things to like, not like and worry about :: Touch, SkyDrive, Apps, and more. This is a great way to write an article. It’s organized, opinionated, and good. Microsoft starts integrating Skype into office :: Not a surprise but it’s nice to learn what the first step is. I want to see what it looks like but I don’t want to install, can you help me out? Oh yes… yes I can. There is more than enough content here. The good writers at ars technica really knocked the ball out of the park. What does the Cloud have to do with Office 2013? The lines are blurring between the desktop and the cloud. Windows 8 will only hasten the situation. From what I’m ready and have experienced myself, it makes Office better. Hands-on: Microsoft Office finally gets serious about the Cloud :: This headline is a bit dramatic. Trust me, Microsoft has been serious about the cloud for a few years now… just ask a Microsoft sales rep how they are compensated and you will know this is true. 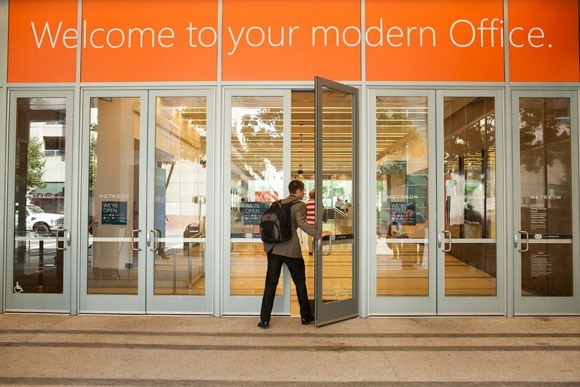 Microsoft defends desktop while moving Office 2013 to the cloud :: Ed Bott… always solid. It pays to have followed the industry for the past 100 years (I say that with the utmost respect Ed). I think he nails it by declaring the fusion of desktop, cloud, and office web apps as the biggest surprise. If you are an Office developer, can you say Agave? More on that next week. Office 2013: Microsoft’s bid to win the future :: Where the world is the iPad version? I’m starting to think I’m wrong and Microsoft will not release an iPad version. Why Microsoft Office 2013’s cloud-based strategy falls short…and how to fix it :: A little cynicism is good. What’s this I hear about streaming Office? It’s called Click To Run (CTR) and it’s pretty darn cool. I’ve installed both the .msi version and the CTR version. I think CTR is slick… especially because I could start using it within minutes of starting the install. How Office 2013’s streaming as a service works :: spoiler alert! It has something to do with virtualization. Are the Office Web Applications actually usable now? Uh… maybe. I think the web apps are great in a pinch when you need to make minor modification. But, in my opinion, nothing beats the desktop experience. I’m sure this will change in the future. Where I can download the Office 2013 goodies? Microsoft Office 2013 .MSI setup packages :: LiveID sign-in required. Does Office 2013 support touch? Yes it does. It’s pretty cool where it works. But it also supports the desktop. So… this leaves Office straddling the fence a bit. If you know what to expect and how MSFT designed it, you will be less frustrated. Is their support of Touch enough? I don’t think so. It’s good but I wish they had been more aggressive and I’ll provide details later. Office 2013: Can complexity and touch get along? Does Office 2013 support Windows 8 Metro? OneNote Metro Style App for Windows 8 :: A special OneNote version for Windows 8’s metro UI. I’ve downloaded and really like it. Because of apps like this, my opinion of Windows 8 continues to improve. I’ve even started to use my tablet in meetings in favor of paper. This is huge because I’m sensitive to the nerd factor. My only major complaint is the lack of options for changing the ink options when using a stylus. Should I skip this version or should I get ready to upgrade? Does it still make sense to buy Microsoft Office? Who was left out of the Office 2013 fun? Office 2013 kicks Vista and XP users in the software :: This is a major shift that supports the disruption that is the tablet. CIOs would be wise not to ignore it. Microsoft to deliver Office for Mac 2011 SkyDrive update, no new 2013 edition :: No new version for Mac fan boys like me. But an update will be released to support SkyDrive. Microsoft’s Office 15 intro comes without iPad flavor :: Dammit. Is this all there is or should I expect more? Office 2013: What we still don’t know :: Release date, Pricing, iOS, and more. In his keynote on Monday, Steve Ballmer said there is even more info to be provided later. I think they held some big things back and will tell more in coming weeks. My first 12 questions about the new Microsoft Office :: I love items like this. I’m amazed at how differently we all think. These are good questions. Holy Cow! That’s a lot of info. See you early next week when I cover the Office 2013 for Developers. Wow, good job Ty! I need a vacation to digest all this! how to change the paper size in excel, for example a 215 mm x 330 mm ? I can conjecture that this bahavior may be caused by executing some code, for example if you have installed an Outlook add-in that sends personal emails or VBA code or probably an Outlook rule. Please check this out.